More than 100 people organized by Good Old Lower East Side, the Cooper Square Committee and other local groups rode to midtown in school buses this afternoon to protest Bank of America. 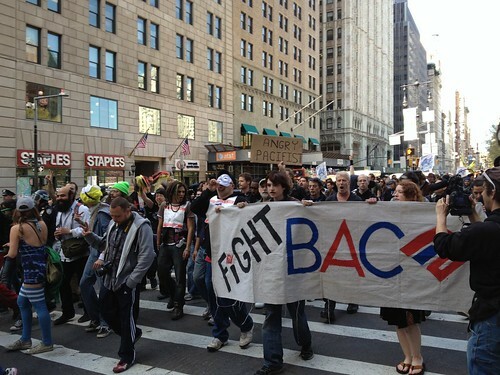 Chanting against Mayor Bloomberg and Monsanto, protesters marched from the Bank of America on Second Avenue to the bed-in at Washington Square Park. “I want to go on the offensive against the ‘get a job’ people,” said Roman Shusterman, an unemployed 30-year-old from Brighton Beach who was holding a sign with an unprintable message about jobs.